"To question all things; - never to turn away from any difficulty; to accept no doctrine either from ourselves or from other people without a rigid scrutiny by negative criticism; letting no fallacy, no incoherence, or confusion of thought step by unperceived; above all to insist upon having the meaning of a word clearly understood before using it, and the meaning of a proposition before assenting to it; - these are the lessons we learn from the ancient dialecticians." EUCLID's aim is to prepare government officials and international civil servants, both active and aspiring, for qualified positions with their national governments, intergovernmental organizations and civil society. This translates into an academic intent to offer the most advanced, dynamic, and as much as possible enjoyable approach to distance learning at the graduate and post-graduate level. In this section, we will discuss the supports or courseware being used, as well as the actual methods of learning, interaction and evaluation. prepare students for global engagement and realistic career goals. In order to help our students achieve these goals, our syllabi/course database includes a large selection of curriculum-documented courses delivered by various means: lectures on VHS/ DVD, MP3s, as well as textbook-based mentor-directed self-studies. The Teaching Company (TT) is a key courseware resource for life-long learners, both independent and school-affiliated. EUCLID incorporates a large number of TT courses as required courseware. These DVDs allow students to experience top-rated US professors without having to incur the expense of attending an physical top-of-class institution. It should be said that in many campuses around the world, actual teaching is often delivered by unmotivated adjunt faculty whose teaching skills (and enthusiasm) may not be satisfactory. For this reason, relying on TT courses provides the students with the assurance of accurate, standard, and engaging lectures. EUCLID/IOSD, an accredited observer at the World Intellectual Property Organization (www.wipo.int) supports intellectual property rights and discourages all forms of piracy and copyright infringement. The Teaching Company brings engaging professors into your home or car through courses on DVD, audio CD, and other formats. Since 1990, great teachers from the Ivy League, Stanford, Georgetown, and other leading colleges and universities have crafted over 200 courses for lifelong learners. The Teaching Company does not offer post-course assignments with grading, examination and credits - but EUCLID does. In addition to Teaching Company recordings, EUCLID relies on standard textbooks (e.g. "Diplomacy Theory and Practice (Berridge)" + "Modern Diplomacy" (Barston)") for its courses. This policy ensures program comparison and equivalencies. However, EUCLID often supplements these textbooks with additional resources that enable high level applications in the real world, or even correct inadequate information sound in the textbooks, a good example being course LAW-INT1. To achieve international access and portability, EUCLID often uses textbooks that can be electronically accessed, including the services available on the SafariX Textbooks Online, a joint venture between the industry's leading technical publishers, O'Reilly Media, Inc., and The Pearson Technology Group. EUCLID faculty members, with the support of volunteer students and interns, are always looking for relevant educational or professional webcasts that may be added to the course requirements and in many cases incorporated into the syllabi. The International Monetary Fund webcasts (coupled with the regular World Economic Outlook and Global Financial Stability Reports) as well as the public lectures held at the London School of Economics are integrated in a number of courses. EUCLID courses use webcasts from leading institutions whose goal is precisely to empower other institutions of higher learning and to prepare future professionals and leaders. Essential professional skills in information technologies tools, such as word processing, online operations and multimedia projects may be required to fully prepare students for highly proficient positions. When and as needed, EUCLID has retained online and CD-bases award-winning. VTC, Lynda and TrainSignal offer high quality courses, labs and certification preparation solutions that enable EUCLID to deliver best-of-class training to its international student body. EUCLID has developed a proprietary CMS (Course Management System) which combines the power of an internet-driven database system managing all academic operations with a full-featured Cloud-based commercial environment called Egnyte. 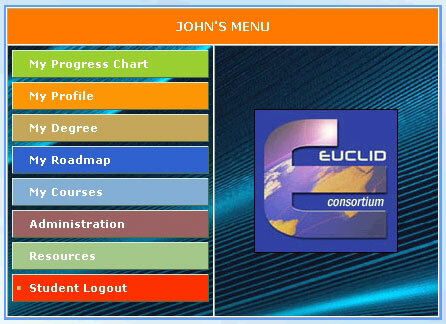 In addition, EUCLID uses a best-of-class LMS (Learning Management System - hosted at www.eucliduniversity.net) which was implemented late 2015 after 6 months of intense R&D and evaluation. EUCLID's LMS platform, inspired by Coursera, leverages the full power of Wordpress and Learndash to deliver an outstanding learning experience. Each EUCLID degree program consists of a recommended sequence of required and elective credit-granting courses. The sequence constitutes the backbone of the student's degree Roadmap. 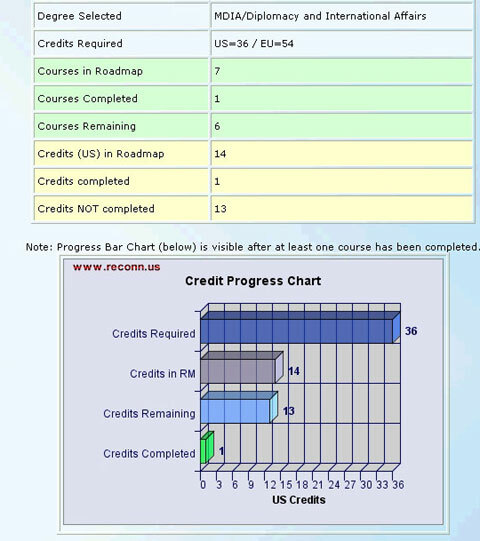 Using the ELEMENTS system, the student is guided step by step and track his or her advancement with a progress chart (below). Credits are granted when the course requirements and assignments are completed in accordance with its academic guidelines. At EUCLID, our goal is to offer students the tools needed to acquire critical knowledge and skills as fast as possible, and to make sure that your academic progress is matched with proper and documented credits. "You may have heard that distance learning is not for everyone. There is some truth to this statement: distance learning lacks intense student interaction, immediate contact with faculty and it often requires being a self-motivated reader. Indeed, EUCLID is primarily a distance learning framework, which means that if the experience of campus life and peer support is essential, you should consider traditional studies, at least for part of your program." Remember that the 'downside' of intensive distance programs that rely on self-discipline and self-learning abilities is that you may have more limited access to faculty and peers. This is not a problem for self-motivated students, but some subjects (especially in the field of science) may require 'outside help'. For this reason, EUCLID accepts credits from other governmental, public or accredited institutions, and may even recommend that certain difficult classes be taken in a classroom environment.